The Picture Palace Theatre on Station Road, Aldershot was built in the grounds of the Aldershot Institute and was designed by the architect John Priestly Briggs who worked for Frank Matcham & Co, and built for the Aldershot Picture Palace Ltd. The Theatre opened in 1912 and had an auditorium built on two levels, stalls and balcony, with an 'elliptical barrel-vaulted ceiling' and a capacity of 708. By 1941 the Cinema was showing two changes weekly with prices of 7d. to 2s. 6d. Continuous daily. By 1965 the seating capacity had been reduced to 626. The Cinema closed on the 12th of July 1977 and was then sold to Rushmoor Council who leased it out and it was then subsequently reopened on the 26th of December the same year. 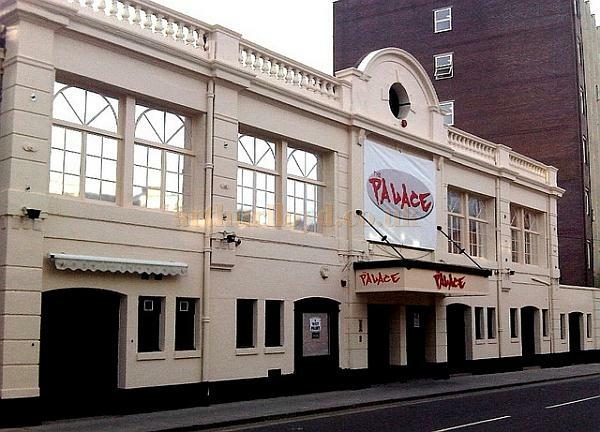 The Palace closed again on the 30th of September 1985 and it was to be for the last time. The Theatre, although by then Grade II Listed, then stood derelict until the Spring of 1989 when it was restored at a cost of £1m and converted into a nightclub called Cheeks. This would later become known as the Vox nightclub. In 2010 the building reverted back to it's original name and began putting on events and live music. There are some more pictures of the building in various guises here, here, and here. Some of the information on this page was kindly contributed by Mervyn Gould, and some details gleaned from the websites of the Theatres Trust and the excellent Cinema Treasures. If you have any more information or images for this Theatre you are willing to share then please Contact Me.